KP338 and KP643, or Click and Clack respectively as Steve and I have chosen to name them (unofficially), have been nesting in or near our yard for over 10 years, long before we bought this home in 2011. 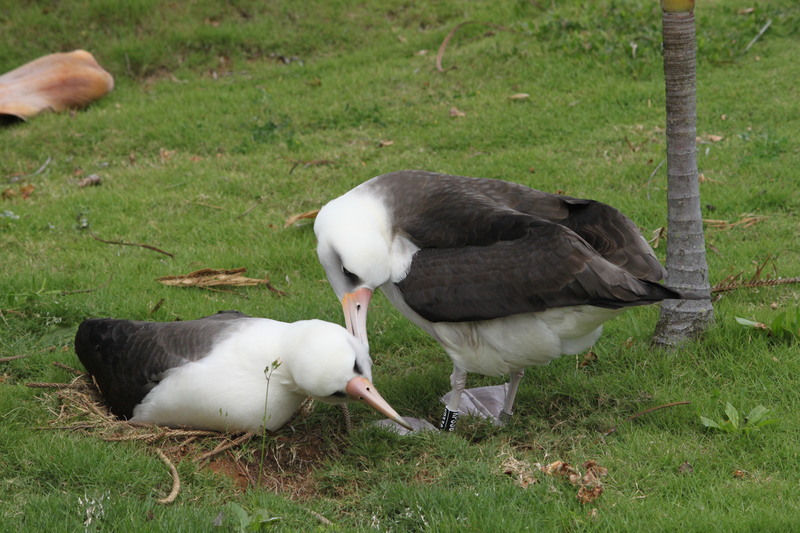 Click and Clack are a long-term dedicated female-female couple; however, they have raised chicks in the past, mostly adoptive eggs from PMRF [hereʻs an excellent article explaining the PMRF adoption program], or from a neighboring failed nest, and sometimes because a randy male made ‘contact’ with one or other or both when they arrived on island. 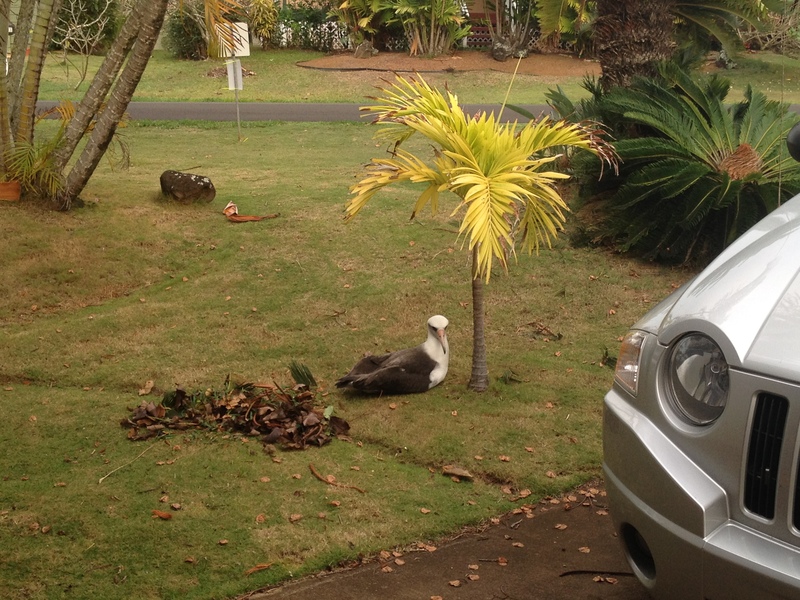 For the first time, we personally have had the treat of a second nest in our own front yard. Another pair (female-female again), who had previously nested on our next door neighbor’s yard, decided on a spot against our side wall within sight of our ‘office’ slider. As with our long-established resident pair, we have watched this devoted couple as they reunited in November after months away at sea, then settled on a nesting spot, built up their nest, swapped incubation duties, and awaited the possible arrival of their chick. Sadly, it was not to be for them. The egg was infertile, and recently cracked and broke open. The incubating partner, KP756, spent a whole day meeping and mooing, walking around the nest, even doing some nest repairs, before finally abandoning her post and flying off to sea to feed. Three days later, her mate KP404 returned. I was surprised to see her immediately settle on the nest even though she was incubating nothing but a broken pile of empty eggshell. She stayed there overnight, but the next day she moved away and, as I write, is now sitting in exactly the spot where she awaited her mate’s arrival in November. The jury is out as to whether KP756 will return this season. It’s likely she has given up and will assume KP404 will do the same. However, the chances are that they will return next season to this same area, whether our yard or next door, to try again. Back to Click and Clack, and a much happier outcome! On January 27 I noticed there was a hole in the egg and sign of a tiny bit of gray fluff. A chick was pipping! It can take anything from 2-4 days for the chick to finally extricate itself from the shell, and on the morning of January 29 the tiny chick was briefly but fully visible while Click shifted her position with a squirming little life beneath her. Thrilled? You bet! Although there is always a chance that chicks will expire in their early days, this little one seems to be active and healthy. Now, we hope Clack returns soon, loaded with yummy fish oil to feed her offspring. Click has been on the nest since January 15 and, while the adults can hold back a certain amount of food for the newly hatched chick, it will be the returning partner who can provide the extra nourishment needed for fast growth and health. Every November, we eagerly anticipate Click and Clackʻs return. In the 2014/2015 season they raised Pip (as the homeowners, we had the honor of officially naming their chick)! We haven’t seen Pip reappear yet (three years is usually the earliest that the adolescents first return to dry land), but weʻll be keeping an eye out next year for sure. 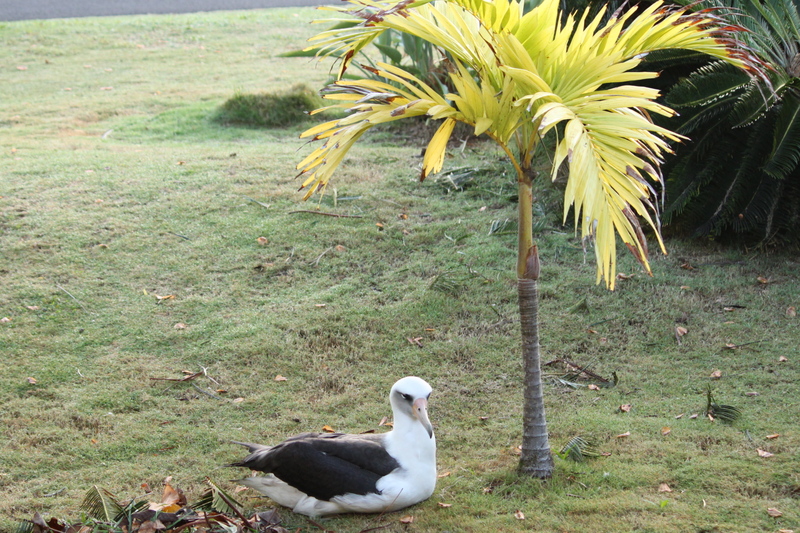 ** Cathy is our dedicated Princeville albatross guru/monitor/friend/savior! 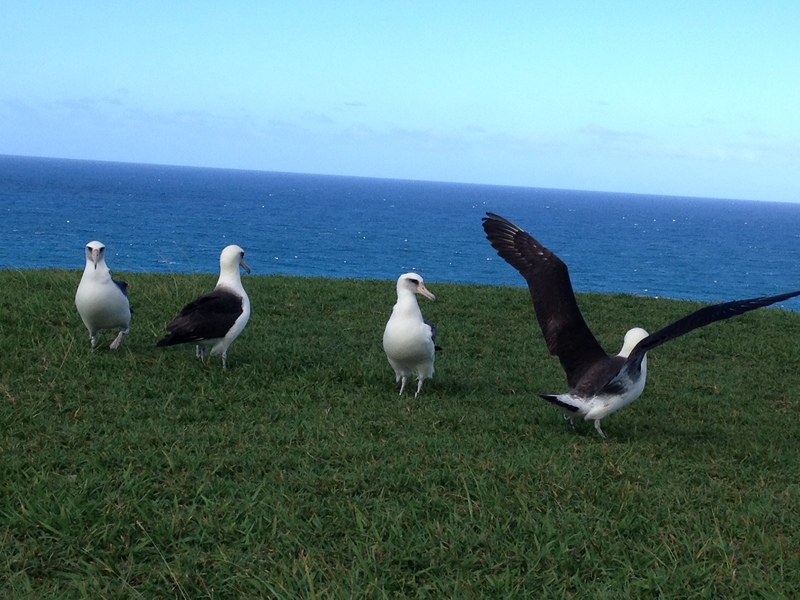 If youʻre interested in learning more about our Princeville birds, her blog My Albatross Diary will give you hours of entertainment and education. And so the world turns! 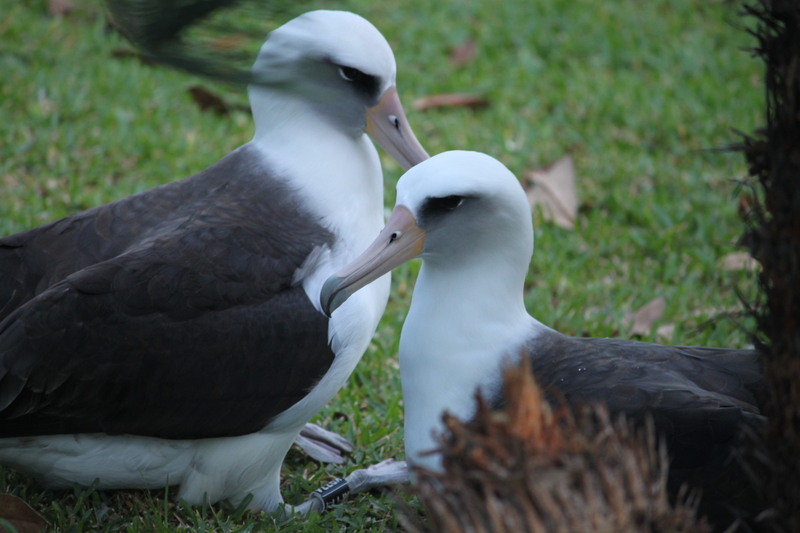 November is the month that the Laysan albatross return to Kauai to mate, nest, and raise their young…well, some of them will raise their young, while others, like our pair of females are more hopeful than successful. Last year I posted the tale of our two. We were fascinated by their behaviors, since that was our first year in residence. This year we were delighted when they returned to our yard to try again. 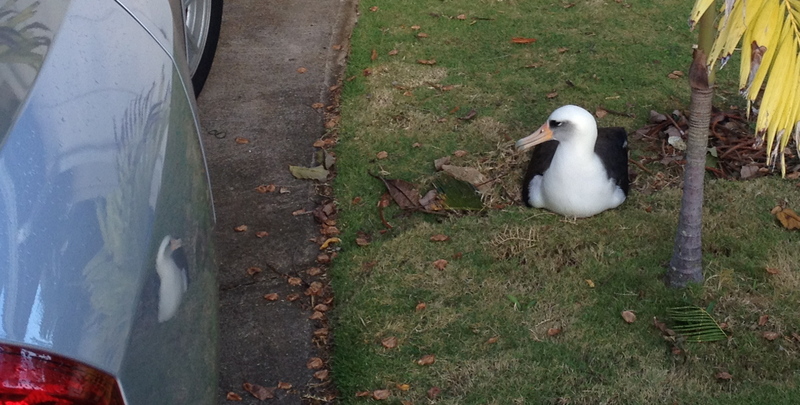 It’s a special day when the first albatross of the season is spotted in our neighborhood. This year the first one was about a week earlier than usual, November 4, but our two always seem to be among the later arrivals. So it wasn’t until November 23 that 338 arrived back in town after spending the summer months somewhere off the coast of Alaska. 643 was just a few days behind her, arriving November 26. They spent the next day close together, clacking, whistling happily, and preening one another. They also scoped out some potential nesting sites. They seemed no more savvy about their nest location than before! Last year they ended up at a low point of our front yard to the right of the garage (after 338 followed one of the eggs that had rolled down a slope and ended up just a few feet from the driveway). This year they chose an equally unsuitable spot…deliberately, it seems! … but, no… perhaps she was influenced by 643, who knows! Together, they moved downhill, closer to the house (on the left hand side of the drive this time), and seemed intent on squatting in what we considered to be the least appropriate spot of the yard, where, during winter downpours, the storm waters gush off the driveway. Not the most comfortable spot to set up the family home. 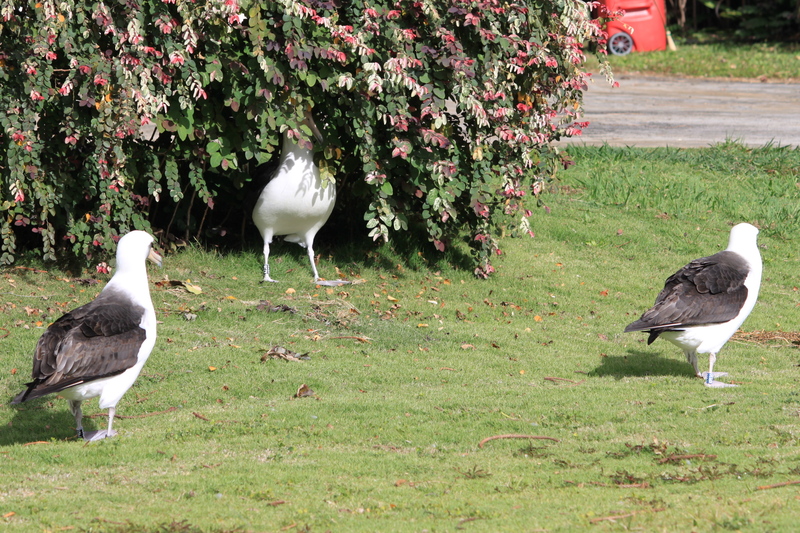 Once an albatross pair have met up in November and (in the case of a heterosexual couple) have enjoyed their roll in the hay, they both fly off again for a week or so, for their albatross equivalent of a baby-moon. So, while our girls were away, Steve (with the blessing of our local albatross guru, Cathy) laid a tarp and a chair barrier, as a form of gentle persuasion (for their own good!) to find a more suitable location. However, bird-brained or doggedly persistent, whichever, when 338 returned on December 3 she was pretty determined to find a way back to that same spot. …even if it meant sitting on a chair leg! Eventually, though, she grudgingly conceded defeat…sort of! She settled just a couple of feet away on slightly(!) higher ground but even closer to the drive than last year and, sometime overnight, laid her egg**. 643 showed up the following day, swapped with 338, and promptly laid her own egg. As is fairly typical for all-female partnerships, since they can successfully incubate only one egg, she forced one of the eggs to the side, giving Cathy the opportunity to remove the abandoned cold egg. So now 643 has settled down to take the first long shift while 338 is away at sea, feeding and building up her strength for the second incubation stretch. Sadly, yet again this year, there is no plan to provide PMRF adoptive eggs to the Princeville nesters, so our two girls will eventually give up hoping for a chick and, sometime early year, will leave the egg and us for their Summer in Alaska. …and so the world turns! It seems that KP338 has finally decided enough is enough, and has left the nest that’s in our front yard. She swapped with KP643 for the last time on March 12, and on that occasion they spent a particularly long time sitting side by side on the nest, ‘chatting’ together, and occasionally sitting up to look at, and chatter at, the egg. On the morning of March 14, I noticed 338 was standing over the egg for several minutes, with no sign of settling down; whereas usually, when a nesting bird needs a stretch, it’s a quick stand-up-shuffle-and-sit-down-again, to keep that precious egg warm. By lunchtime she had left the nest, waddling around the front yard and back-and-forth across the driveway for a while, before settling down a few yards from the nest under the sago palm…yes, the same sago palm where both she and 643 had laid their eggs back on December 4 and 5, before 338’s egg rolled down the slope to its resting place nearer the garage. We won’t remove the egg yet (amazingly, it’s still whole after almost 3-and-a-half months!) unless of course it breaks and emits an unholy smell! We’ll just let nature take its course. 338 is likely to return to the nest a few times, even though she has now let the egg go cold. 643 might return, and they might still hang out in the neighborhood together for a while, just like our neighbor’s couple that I featured in my previous post. If we’re lucky, they’ll treat us to some noisily entertaining and affectionate displays of their own, before eventually heading off to Alaska for the summer months. I’m already looking forward to November, assuming they return for another try, when I’m hoping some randy male gets to one or other of them before they settle down together. The couple in the video nested this year in a neighbor’s yard, but the egg wasn’t fertile and eventually broke, so now they’ve settled in the yard next door to their nest, and we see them almost daily displaying like this. 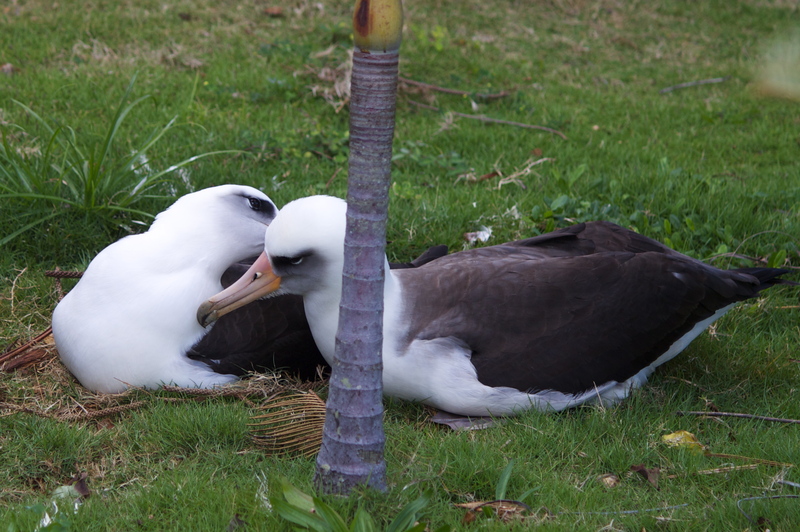 These displays are common among our neighborhood albatross at this time of year – either couples whose egg did not successfully hatch, like these two, or non-nesters seeking a partner for future years. Often, we also see larger groups of 4 to 6 adolescents ‘displaying’ together. It’s always fascinating to watch their moves! Eventually this couple will fly north for the summer, but this continued ‘affection’ indicates that they plan to return to their nest, or close by, next year to try again. 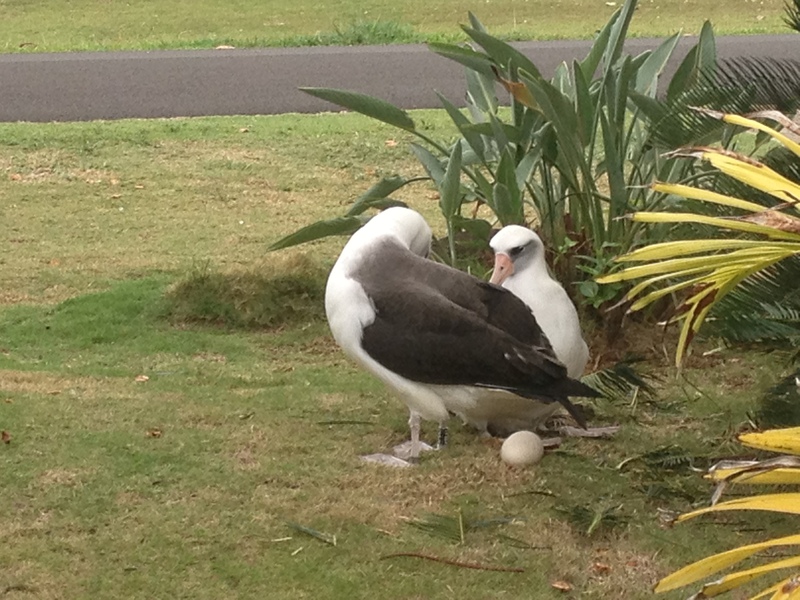 In my previous post, I introduced the pair of albatrosses nesting on our front yard, KP338 and KP643, and their infertile egg. Last Tuesday, 338 returned to take over nesting duties from 643. 338 had departed on February 6, so she was gone for 13 days. That’s the shortest swap for our pair. The whole nesting process must be very tiring for both birds, and their stamina level must drop as the incubation period continues. The first nesting period is usually the longest (for 338 and 643, that was 26 days this season from December 4 to 30). I was in the ‘office’ (at the front of the house) at 4:15pm when I heard them chatting together. The sound of a returning mate is very different from the interactions that a nesting bird might have with passing ‘acquaintances’. I watched as 338 settled down beside 643 (still on the nest) and as they preened and chatted; then 338 stood up and wandered around, picking at grass or leaves, and dropping them nearer the nest. I’m not sure whether 643 was reluctant to leave the nest (I’m told that pairs swap quite quickly on an egg, but are more resistant to their mate once the chick is hatched), but it took some 15 minutes before 643 relinquished her warm spot to 338. Roles were then reversed, with 338 plucking grass and debris for the nest, occasionally stopping to chat and preen her mate, while 643 adjusted herself on the egg. I wish I knew if our pair had ‘discussed’ their egg, and reached a decision as to whether to give up on their hope of an offspring this year. Still, for the moment, it seems as if 338 is content to take another turn. I must have compiled half a dozen or more posts since my last of December 28. Unfortunately, they were all composed in my head, either while driving around the island (plenty of time for contemplation at a maximum of 50mph), or during one of my frequent bouts of insomnia (which I attribute to age, not location!) So, apologies for the extended absence and, obscenely belatedly, Happy New Year…or, rather less belatedly, Gung Hay Fat Choy! 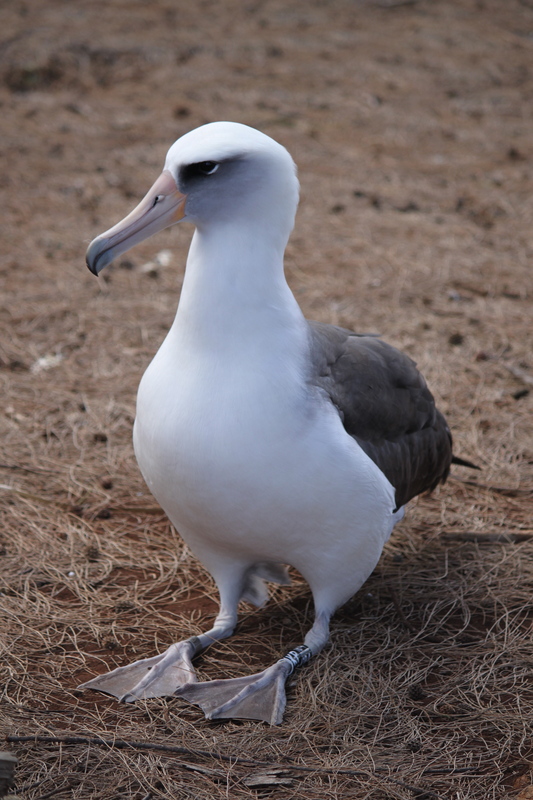 One of the most frequent topics for my mental musings is our local population of laysan albatross. 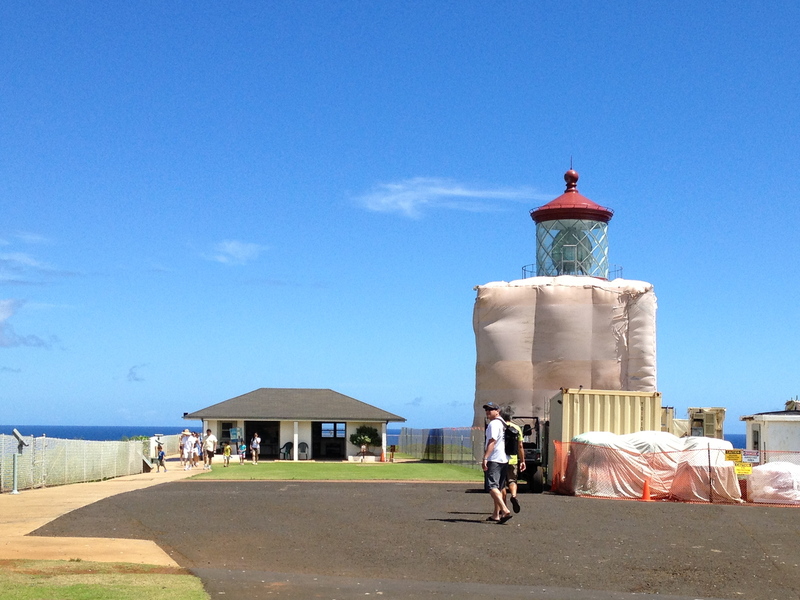 I briefly mentioned some weeks ago that they were/are back on Kauai. They started returning mid- November. Once one appears, it seems they all stream in. After courting and mating, all the nesting pairs concentrate on incubating their (single) egg and raising their chick. Each parent takes it in turn to fly all the way back to Alaska to feed (yes, seriously, a round-trip of roughly 6,000 miles), while the other is dedicated to sitting full-time on the egg. They swap every two or three weeks until the egg is hatched, then more frequently as the chick grows, often covering the round-trip in only four or five days. Not surprisingly, the nesting bird is too hungry to hang about for long once its mate returns to relieve it. So, during this incubation stage, the neighborhood goes a little quiet for a while. However, the activity level picks up considerably early in the new year, when the non-nesters start appearing. Non-nesters include those adults who for one reason or another do not have a partner this year, as well as the three to seven year old juveniles who are not yet old enough to mate, some of whom have returned to the island for the first time since they fledged (they usually spend the first three years at sea). 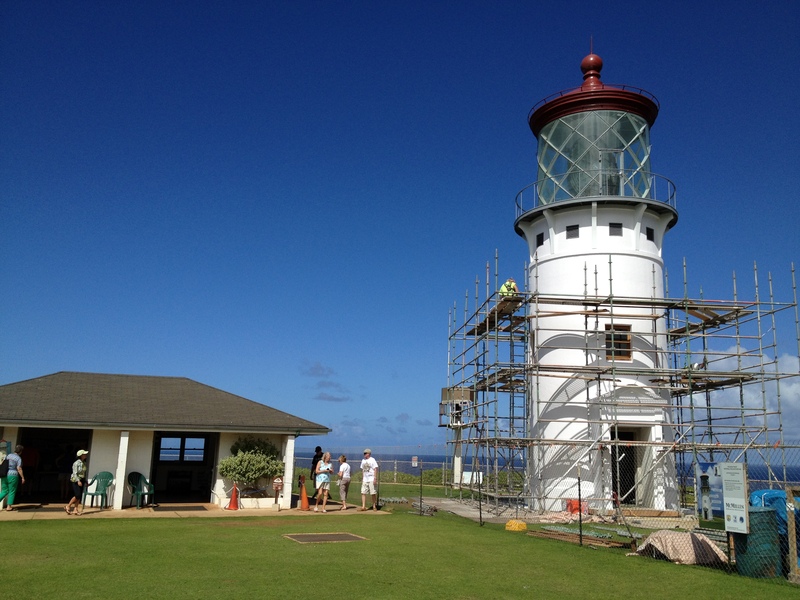 Each chick is banded before it leaves the nest; Kīlauea Point and Princeville chicks are given a ‘KP’ prefix. Last year, KP338 and KP643 nested on the border between our home and our neighbor. I learned a little about this pair at that time, but, since we only visited our new ‘vacation’ home for a week or two in February 2012 and again that April, we didn’t see the whole process through all the stages. However, we did find out that they are both females. We were surprised to discover that female pairs are quite common. It’s not known why this happens, but they are definitely as dedicated as their male/female counterparts in incubating the egg. When both females lay an egg, one of the eggs has to be removed, as they only have the resources to incubate and raise one chick. Of course, the chances of them having a fertilized egg are somewhat limited…but not impossible, since there’s sometimes a randy male hanging around the neighborhood ready to jump their bones when they first return to the area! Sadly, last year’s egg was not fertile. In some cases, an adoptive egg can be given to an all-female pairing. 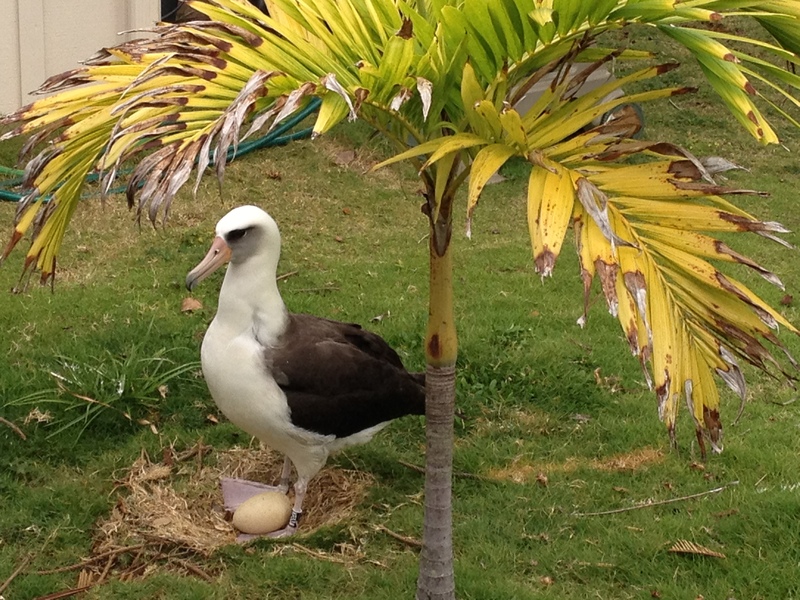 A program was instigated some years ago to replace infertile eggs with proven fertile eggs from pairs nesting on PMRF (Pacific Missile Range Facility) land. 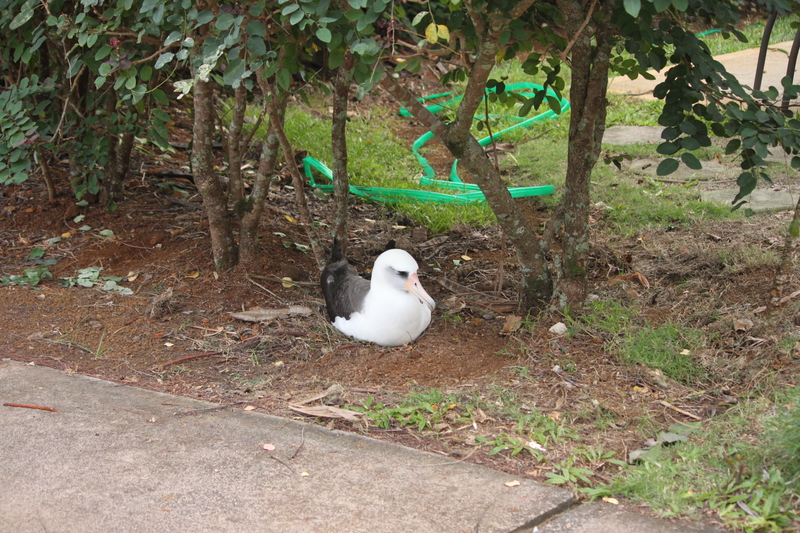 The idea was to reduce the PMRF colony of laysan albatross to avoid collisions with aircraft by relocating the eggs prior to hatching, since an albatross will typically return to the area where it hatched. 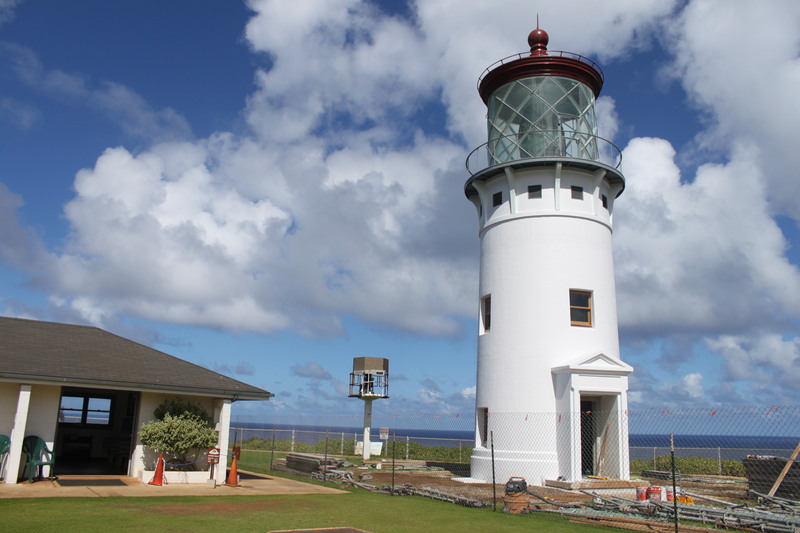 Initially, adoptive eggs were relocated to the KPNWR (Kīlauea Point National Wildlife Refuge) only, but it was later extended to those birds nesting on private lands (such as Princeville). This wasn’t an option for our pair last year as, for some reason known only to herself, 643 decided to move two doors down to lay and incubate her own egg, while 338 was left alone at the original nest site. Without two adults to incubate an egg, there’s no hope of success, since, as I already mentioned, they must take it in turns to leave the nest to feed. This season, the same pair returned, and this time ended up with their nest just a few feet from our garage, on the edge of the driveway. Not that that was their original intention! They started off tucked behind a sago palm and a bird of paradise plant, at the top of a small slope. 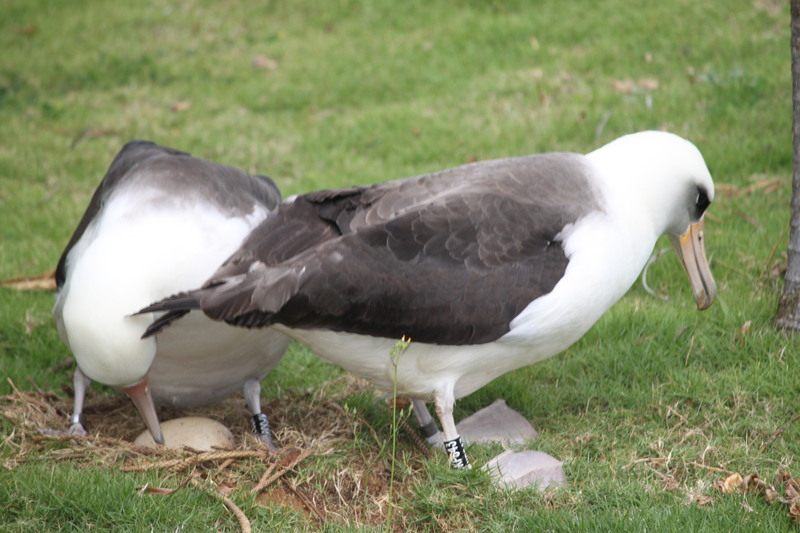 643 laid her egg first, on December 4, and left 338 to incubate it. 338 laid her own egg the following day, slightly to one side … unfortunately, it was closer to the slope and at some point during the day, presumably while 338 was shuffling around and beginning to pull some grass around her to form a nest, the egg rolled down the slope. KP338 on the eventual nest site, admiring her reflection in the car! On the positive side, since 338 was by now nesting some distance from the sago palm, it was easy to remove 643’s egg without causing 338 any grief. To avoid disturbance, the ideal is to keep at least 15 feet away from nesting birds but, given their location, that’s simply not feasible for us, or at least for the car, this year. Thankfully, neither 338 nor 643 seem too bothered by our comings and goings (though, of course, we don’t open the passenger door right next to them). At the risk of imposing human characteristics on these beautiful creatures, our pair do now seem to recognize our voices and appear quite comfortable on their accidental nesting site. We had hoped that their infertile egg would be replaced with a PMRF egg, but sadly this year the State has decided not to extend the adoption permit to private lands. 😦 So, for now, our pair continue to incubate their egg, with no hope of hatching a chick. At some stage either the egg will break or the pair will simply give up hope and abandon the nest. They have been particularly faithful to each other and to their nest this time, despite the egg relocating itself, so we’re hoping they will have another go next year. 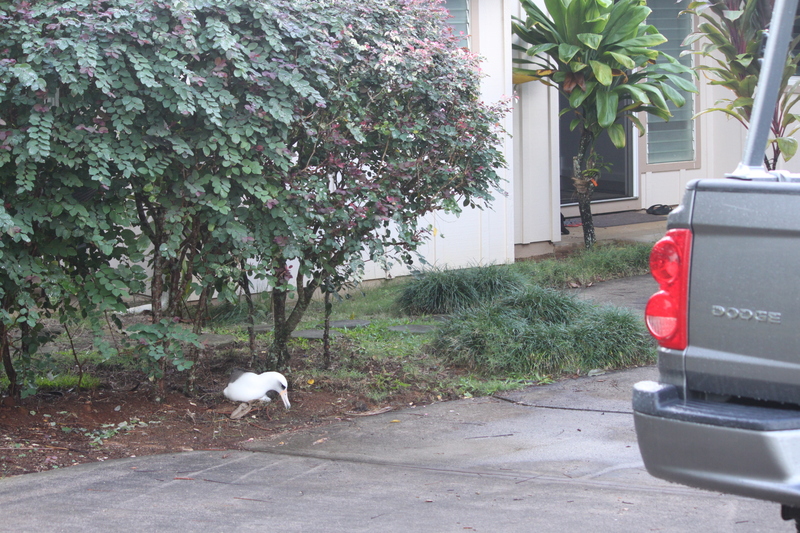 Meanwhile, the happier news is that we now have 18 chicks in Princeville. We’re enjoying watching the little balls of gray fluff grow, day by day, in our neighborhood. 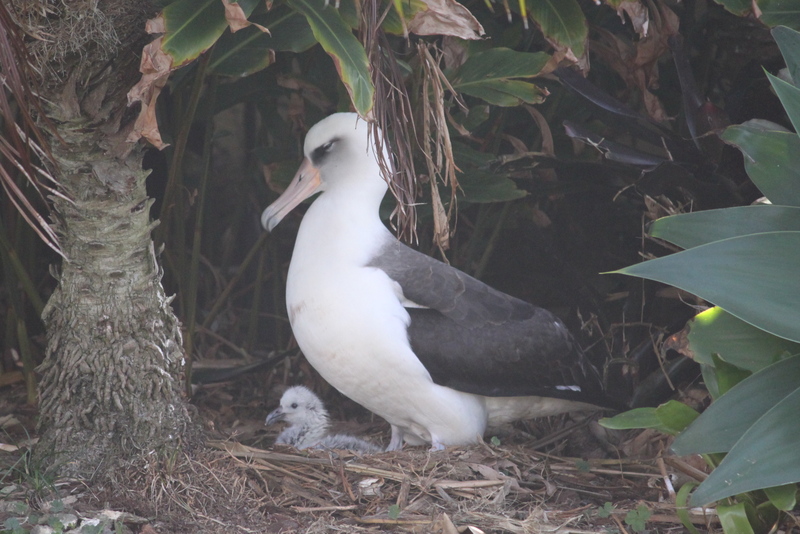 Once again, I highly recommend Cathy’s blog, My Albatross Diary, as an excellent and entertaining source for more detailed updates on our Princeville chicks, an insight into albatross parenting, and many more great photos and videos.